Update (6/21/15) - A lot of people have asked if we're feeding this fox, and that's why he's in our yard so often. The answer is an emphatic "no." I have no doubt that there are some people who are providing food, perhaps inadvertently, in the form of cat or dog food, but I would never leave food for a wild animal. They shouldn't get too comfortable around, or come to depend on humans. Having said that, I do leave a five gallon bucket of rain water uncovered on our back porch, and I've seen the fox get a drink from it from time to time. If you've spent much time around mockingbirds, you probably know that they're quite territorial, and will vigorously defend what they believe to be their personal space (which is generally arbitrary and expansive). I've shared this before but on at least one occasion I've worn a motorcycle helmet while mowing the lawn to protect my head from a spiteful mockingbird. 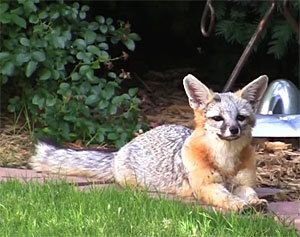 So, it was no great surprise when I witnessed a mockingbird harassing our back yard fox earlier this week. We suspect there's a nest hidden in the thick foliage of the Mexican elder that's planted next to the back wall. I was fortunate enough to have my video camera running when it happened. By the way - let me put this as delicately as possible - if you watch closely toward the end of the video, I believe there's evidence that dispels the question of whether we're dealing with a regnard or a vixen. This page contains a single entry by Eric published on June 19, 2015 3:32 PM. Filling the Dance Gap was the previous entry in this blog. Car Repair Customer Service Done Right is the next entry in this blog.